If you have been to Seoul, the Seoul metropolitan subway train (“Seoul Metro”) is surely one of the means of transportation you have used. While waiting for the subway train on the platform or riding on the subway train, I like to look around since sometimes I can find some interesting things – let me share with you some of these in this post. Inside the train, there are posters/ advertisements hanging from the roof and pasted on the sides and/or the doors of the trains, some of which are quite interesting. For example, during my recent trip to Seoul, I noticed that there were small posters of a character which dressed in a uniform like the members of the South Korean Special Forces Unit in the recent hit Korean drama, “Descendants of the Sun” (태양의 후예). 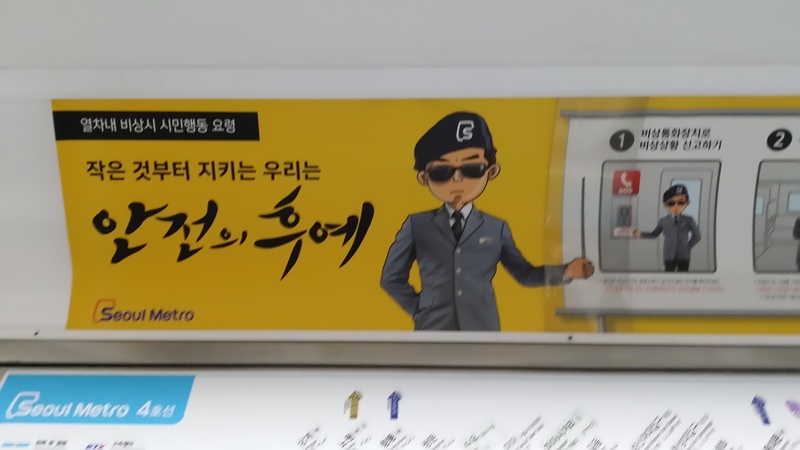 In the posters, the character teaches information relating to safety on the Seoul Metro, for example, how to act during emergency (including using the SOS phone on the train), not to force your way into the train while the train doors are closing, etc. so that all of us can become the “Descendants of Safety” (안전의 후예). On the platform, you can find white Korean characters pasted on some of the glass screen doors. 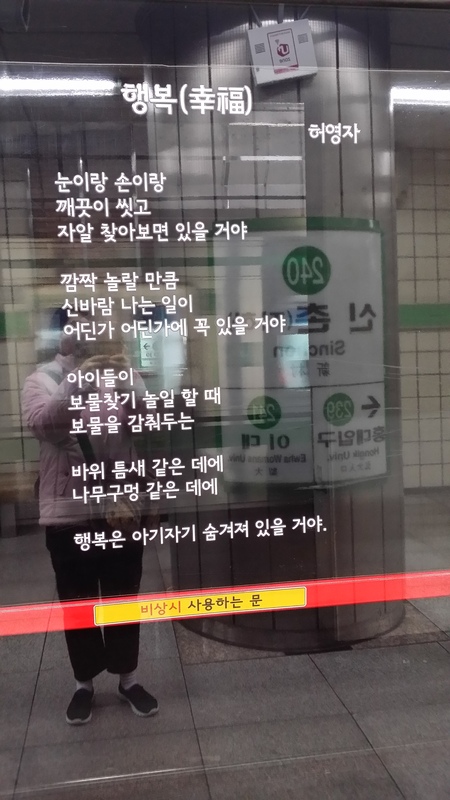 They are Korean poems and if you can read Korean, you can enjoy Korean poetry even while waiting for the trains. I also like to take photos of these poems so that I can read them at my leisure. ← How to welcome the New Year in the Korean way?